Kate Washington and Guy Zangari with local firefighters. 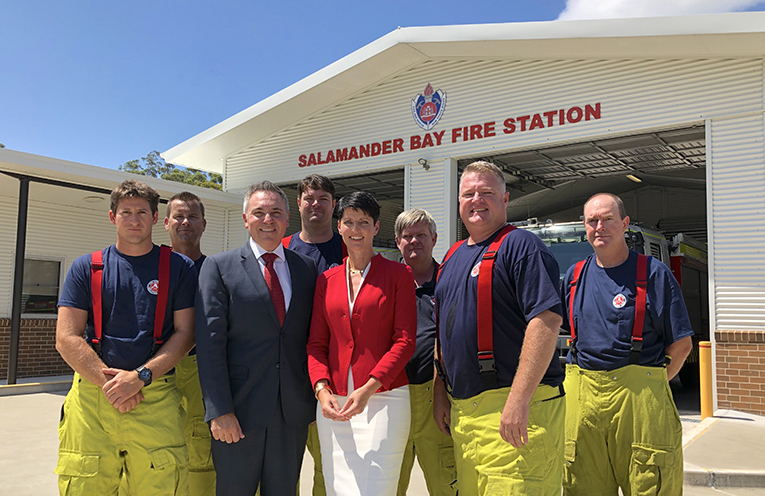 A Daley Labor Government will make the Salamander Bay Fire Station a permanent 24/7 facility for the first time, with an additional 16 permanent firefighters for the Bay area. NSW Labor this week announced an additional 200 permanent firefighters across the State, including 116 more firefighters for regional areas in New South Wales. NSW Shadow Emergency Services Minister Guy Zangari joined Port Stephens MP Kate Washington earlier this week morning to announce that 16 of the additional 200 firefighters will be posted to Salamander Bay Fire Station, allowing it to become a fully operational 24/7 fire station for the first time. Salamander Bay Fire Station services the growing area of the Tomaree Peninsula, including Nelson Bay, Salamander Bay, Anna Bay, Fingal Bay, Soldiers Point, Corlette and Shoal Bay. The station currently has a mixed model of on-duty firefighters and on-call (retained) firefighters. The commitment will see Salamander Bay become a fully operational 24/7 fire station – a significant boost to fire and emergency protection on the Tomaree Peninsula. The commitment comes after Mr Zangari and Ms Washington hosted a roundtable meeting with local community groups and business representatives in May last year to discuss local emergency response times and the unique fire risks facing the Bay area. Attendees at the roundtable included representatives from the Tomaree Ratepayers and Residents Association, Tomaree Business Chamber, local aged care facilities, local community and sporting clubs, and the firefighters union. Since then, Port Stephens has experienced a number of serious fires that have placed homes and properties at risk, including the most recent Mambo Wetlands in Salamander Bay. “Our communities have seen these firefighters in action in recent months and know how important these extra firefighters will be to keep everyone safe into the future,” she said.